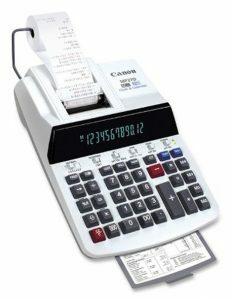 The Canon MP27D calculator is a heavy-duty printing model that offers an extra-large display, two-color printing and a host of other high-quality features. The profit margin calculation, clock and calendar function have all been designed and added to improve the efficiency of the busy professional. It also includes a quick reference guide for main functions or for address book information. Great printing calculator. We use this calculator in work at all our accounting desks. Easy to use. Keys are arranged for easy use. Some other calculators have keys arranged in an unusual way but this one is great. It replaced our old Texas Instrument TI-5660 model and works exactly the same way. My old MP27D calculator that I'd had for over 5 years conked out and I looked around at some one replacements. They had too much or too little. Based one the reliability and easy of use I searched Amazon to find the last one of a discontinued model and was luck to find one and at half the price of the newer ones. I have used Canon calculators in the past and liked them. There is a new feature on this model that is a power save mode. It makes me nuts. Everytime I go to enter a number it seems I have to first hit CE/C so that the power safe mode allows the input. YOu reach over and start entering numbers and it sounds like it is processing fine. You glance over to see your work and realize that the number you just entered never registered because of the darn power save mode. I hate this feature. Other than that, it is a good calculator. I use this type of calculator at both work and home. I was extremely happy to have found it online to replace my home calculator. It was advertised as "never used", but the paper feed was not working when I first got it. After using it for a few days, an old and yellowed piece of paper worked its way out of the paper feed. It was from the PREVIOUS owner. It works fine now. Product was as described. Ribbon had come loose and it took at least 3 tries to positioning it correctly to print. Instructions are quite inadequate to figure this out. SO glad I cut my teeth on this ribbon method or the machine would have gone back. Perfect calculator. Perfect quality. We ordered this because our existing one broke and we wanted to replace what we had with the same model. We are very happy with this purchase.